© 2012 The Allen Ginsberg LLC. All rights reserved. Ginsberg photographed by Burroughs, 1953. 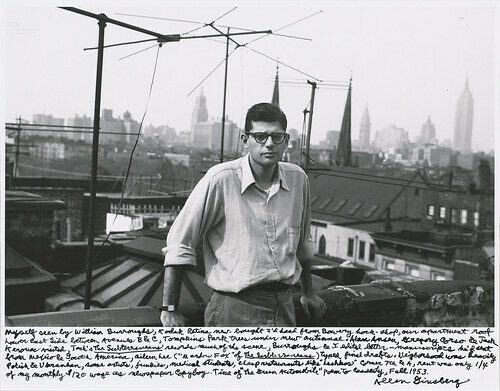 Next week is going to be a special one for fans of Allen Ginsberg: Wednesday evening the poet’s friends and colleagues will gather to celebrate the reissue of “First Blues,” and Monday, an exhibition of his photos will open at NYU’s Grey Art Gallery. “Beat Memories: The Photographs of Allen Ginsberg” originally showed at the National Gallery of Art in 2010, and gathered photos taken from 1953 (when Ginsberg documented his friends William S. Burroughs, Gregory Corso, Jack Kerouac, and Neal Cassady in their salad days) to 1996, when he photographed himself turning 70. Now Sarah Greenough, the D.C. gallery’s senior curator, has gathered 80 photographs that appeared in the previous exhibit’s handsome catalogue and will display them alongside 14 additional photos on loan from the Howard Greenberg Gallery in New York. © 2012 The Allen Ginsberg LLC. All rights reserved. 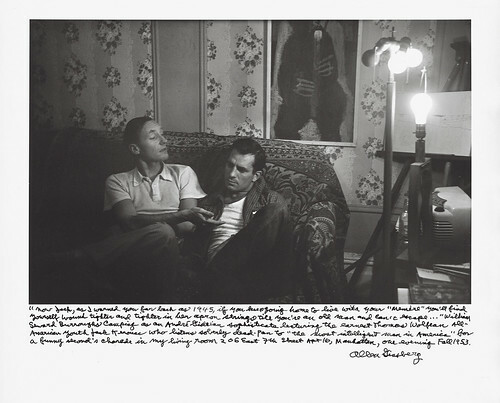 Burroughs and Kerouac in the East Seventh Street apartment, 1953. Another famous photo, taken on the East Seventh Street apartment’s fire escape in September of 1953, shows Jack Kerouac puffing on a cigarette, a railroad brakeman’s rulebook in his pocket. 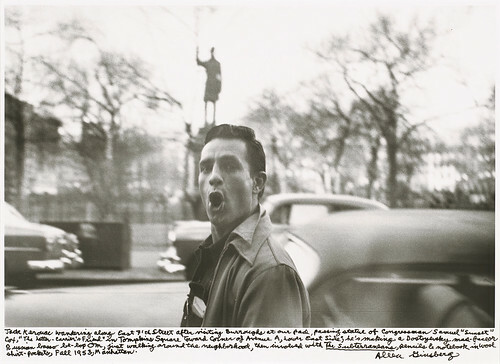 And another widely circulated shot of Kerouac shows him walking down East Seventh Street, “making a Dostoevsky mad-face,” as Ginsberg described it. © 2012 The Allen Ginsberg LLC. All rights reserved.Kerouac on East Seventh Street, 1953. 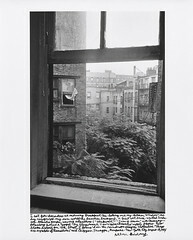 Other photos were taken in San Francisco, Tangier, Kyoto, at Timothy Leary’s Millbrook Psychedelic Community, and at Ginsberg’s Cherry Valley farm, but of course it’s the East Village shots that will captivate neighborhood denizens: Harry Smith staying at Ginsberg’s East 12th Street apartment as he recovered from getting hit by a car on Avenue A; the zen shots he took of the Tree-of-Heaven outside of his kitchen window; Burroughs heading back to his “bunker” on the Bowery in 1985, and perhaps best of all, Bob Dylan posing for a photo in Tompkins Square Park in 1990. “Ten minutes later we were chased out onto Avenue A by homeless men sleeping in the bandshell who threw bottles at us mistakenly thinking we were taking their pictures,” Ginsberg recalled in the caption. You’ll have a chance to see those photos — plus original manuscripts, correspondence, and drawings — during the opening reception on Jan. 14, from 6 p.m. to 8 p.m. The exhibit runs till April 6. More here.